Error in retirements table, Massa and Sutil have switched places in the table, Massa completed 0 laps, Sutil 47. The Danie, staring from fourth, spun and lost several positions as a result of the crash, but recovered to finish in ninth place. You understood it incorrectly, guys. You don't need to worry about time cushion Vergne had at the finish, as he served this very penalty during his second pitstop. The only addition is 1 penalty point (not 5 extra seconds or any other time penalty). Why Hamilton could not be satisfied? Really? Meant is: why Hamilton should not feel satisfied. Of course he could be satisfied (think of Nicole. Don't you wish your girlfriend... etc. "Third place went to an HTP Motorsport Mercedes-Benz SLS AMG driven by Stef Dusseldorp. The German ended up just under three tenths behind Pier Guidi in the car he shares with Sergei Afanasiev and Xavier Maassen." In spite of his name Stef Dusseldorp is not a German but a Dutchman. "................Massa, using a new ring wing which he described as 'positive', was unable to complete his long run in the afternoon because of an issue with his car............"
I'm guessing you meant rear wing? "Lewis Hamilton's Formula 1 qualifying woes continued at the Hungarian Grand Prix on Sunday when a fuel leak in Q1 caused his Mercedes car to burst in to flames"
Maybe you diffuse the foul air of controversy with some kind of handheld battery fan? In the story about Stewart not attending Michigan, I think you've mixed up Sonomo and Watkins Glen. Damn Skype has invaded even the Paddock Club! Is there no limit to bloody MS all pervasive reach? I haven't been able to copy-paste text in forum messages for a long time. Do others experience this, as well? That's not an TUSC Z4. But there are plenty on LAT if you need help finding them. Dunno if it's an error, but I found the photo used in http://www.autosport...t.php/id/116183 a bit suggestive. It didn't look that dark from the TV footage. I don't know how the cameras were set up, but I think autosport should be a bit careful with this. How do I know for sure which one is correct? TV cameras tend to make things look a lot more bright, at least that was always the case at American races(just in case our cameras are different for NTSC/PAL reasons). They do, but A3 is right as there's no guarantee the photo he referred to is correct either. It's even easier to make things look darker with a camera as it is to make things look brighter than they were. "Lewis Hamilton and Nico Rosberg have been told not to change their approach to racing each other, even though Mercedes has not yet secured the drivers' title"
This was the lead-in to a recent article. However, Mercedes will never secure the drivers' title because Mercedes is not a driver. The "cost of competing" is pegged at $120m, but the article goes on to say that income from FOM stands at £55m -- "roughly half" of the $120m figure. £55m is more like $90m dollars, which is three-quarters of $120m. Not roughly half. Edited by Risil, 28 October 2014 - 12:42. Robert Kubica's World Rally Championship future in doubt for 2015. Sources close to the 2007 2008 Canadian Grand Prix winner say he is not yet certain of the direction he wants to take. It is so nice, you have to post it twice. Is this the place to report problems with articles in the App? If so the F1 press conferences for the last few events have had no text in the article. The 2008 world champion, whose 12th place in the drivers' standings is the worst result of his F1 career, said the race went more or less how the team had expected. Just hours after Mattiacci said he was fully focused on helping the Italian outfit move forward with its plans for 2014, a statement from the Maranello team said that he was being replaced. Dieter Rencken's latest column gives Porsche's last Le Mans win as 1989, should read 1998.
on the official FIA WEC site. Edited by Felix, 04 December 2014 - 13:15. As well as misreading, engaged the keyboard before the brain. Senior moment. "Thanks to a pitwall gamble, Winkelhock was the only driver on full wets"
He wasn't. He started on inters! After lap 2 he pitted again and changed them for full wets, still holding the lead. Fans will recall the disastrous pre-season images of Red Bull-Renaults regularly breaking down in clouds of white smoke. Considering its late start with F1's new hybrid V6 turbo formula, and the initial performance and reliability deficit to standard-setter Mercedes, the season that followed represented a remarkable turnaround for everyone at Renault's Vichy base. 'Allo 'Allo, this doesn't sound right at all. Viry, maybe? There's a typo against Japan Super Formula. It has 2nd worth 7pts instead of 15. According to AUTOSPORT's sources, speculation that a race programme encompassing Le Mans and a full-season assault on the GT Le Mans class of the Tudor United SportsCar Championship in 2106 has already been signed off is wide of the mark. In fact, only twice since its first world championship grand prix (in 1951) has Germany sat out a year, with the other seasons being 1955 - in the wake of that year's Le Mans disaster that killed 77 spectators after a Mercedes flew into a crowded grandstand - and 1960, when it was run for Formula 2 cars after drivers decreed the heavily-banked, stretched oval Avus circuit too dangerous. 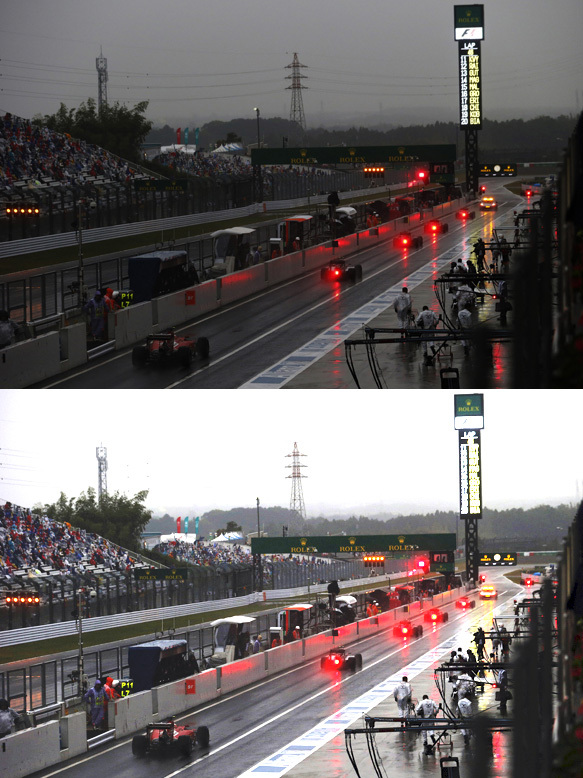 Yes the race was switched to F2 cars on the Suedschleife, but this happened AFTER the drivers boycotted the proposed F1 GP at Avus and the ADAC found itself with a spare date. Competitive Porsche F2 car or not played no role in persuading the the drivers, led by S Moss, to boycott Avus. In 1960 Germany had von Trips in F1, and therefore every reason to run a world championship F1 round. Spelling error in the live forum. Here is how to find that. Opening the Live Forum at the bottom. Posting to this service requires memebership of the autosport.com forums. Notice the word that I underlined. TheADAC had also lost a shedload of money in the political, and temporary, move to West Berlin. I've never seen a single contemporary reference to there being plans to repeat the exercise. There was some talk about it being an experiment for the 1961 formula. Never bought that line. m.autosport.com is down in the US... been this way all morning...any updates? Thanks for reporting this - I've asked our developers to investigate. Edit - finally up and running again now. Sorry that took so long! doesn't mention where the race was held (Termas de Rio Hondo). This stuff's important! Edited by Risil, 08 March 2015 - 14:29. Of 15 constructors to win the title since its inception, just three survive to the present day, less than the number (four) currently facing extinction. I might be misunderstanding this sentence, but it seems that Ferrari, McLaren, Williams, Red Bull and Mercedes make five, with possibly a sixth in Lotus as Renault and Benetton. "Horner's team won the world championship from 2010-14, taking Sebastian Vettel to a string of drivers' titles in tandem with its constructors' success." When you go to the actual story, the headline says "Williams adamant it has engine party with works Mercedes F1 team"
Edited by b195, 20 March 2015 - 14:14.